1. Mass and boundary conditions: The notion of mass for asymptotically (A)dS space and the relation to the AdS/CFT correspondence. The notion of Bondi-Trautman mass in higher dimensions. The notion of quasi-local mass. 2. 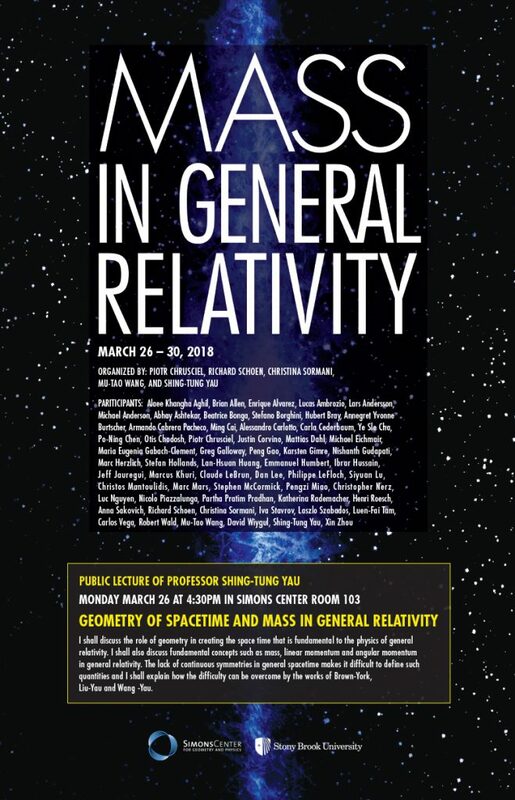 Inequalities involving mass: The spacetime Penrose inequality. 3. Mass and interior geometry: What does the mass defined at the (either finite or infinity) boundary tell us about the interior? When the mass is small, the interior should be close to a flat space. On the other hand, when the mass is large enough compared to other geometric data, black hole or trapped surface should form. This is within the context of the hoop conjecture. 4. Mass and initial data set construction: Density theorems. Center of mass and CMC foliations.